The annual Global Retail Theft Barometer, underwritten by Checkpoint Systems, reveals that UK retailers lost more than £3.1bn worth of inventory in 2014, equating to 0.89% of total retail sales, with shoplifting the biggest problem for home improvement stores. When analysing shrinkage - comprised of shoplifting, employee theft, supplier and administrative errors - as a percentage of sales, the UK performed better than most nations, ranking fifth best, behind only Norway, Switzerland, France and Poland. However, value-wise, due to the size of the UK retail industry, stores lost the sixth most globally, behind the USA, Japan, Russia, Germany and China. The latest report highlights that, in 2014, shoplifting accounted for 26% of all inventory loss, while retailers saw £770m stolen by employees and a further £300m lost as a result of supplier errors. Globally, UK stores had the worst level of administrative and non-crime losses, with 40% of all shrinkage coming as a result of internal errors, such as pricing mistakes - Brazil was the next highest with 29 percent, followed by Spain at 25 percent. According to the figures, dishonest employees accounted for a larger share of total shrinkage than the year before - an increase of nine percentage points. Shoplifting and internal errors also accounted for a higher percentage of the total loss in 2014, while the biggest reduction was seen among suppliers, where there was a decline of 12 percentage points on the year before. From sector-to-sector the source of shrinkage varied, highlighting the importance of understanding where losses are incurred. In grocery stores, administrative and non-crime errors accounted for the largest share of losses. For home improvement and gardening stores, shoplifting was the key cause of shrinkage, with customers responsible for 70% of their losses. Across the country, shoplifting remains a major issue for retailers. Despite seeing a decline in shrinkage as a percentage of sales, thieves continue to target stores. More than £800m was stolen in 2014, with official Police data revealing that there were more than 329,000 incidents of shoplifting nationwide in the same year - a 3% increase on 2013 levels and around 27,000 more than in 2012. Of the 44 forces analysed, just 14 recorded a decline in shoplifting last year. 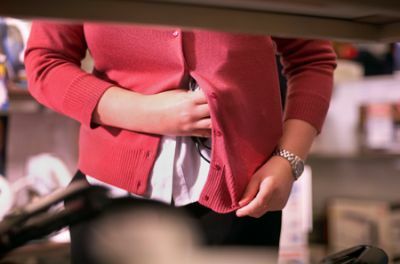 Shoplifters and dishonest employees primarily targeted small and easy-to-conceal items, as well as high-value items with high resale value. When sorted by retail vertical, the most stolen items included fashion accessories, power tools, mobile device accessories, wine and spirits, and razor blades. The latest edition of the Global Retail Theft Barometer reveals that the UK retail industry continued to spend around £2bn on loss-prevention solutions - the equivalent of 0.58% of sales in 2014. Of the retailers surveyed, CCTV/DVR, security guards, and alarm monitoring solutions are used by a majority of stores, with three in four respondents reporting usage of each of the solutions. Among product-specific loss prevention solutions, 63% of retailers used EAS (Electronic Article Surveillance - labels and hard tags/EAS antennas) solutions. Spider wraps and security keepers (38%), and shelving solutions to control product access (38%) were used by retailers in the UK. Checkpoint Systems' Russell Holland commented: "Overall, we've seen shrinkage as a percentage of sales decrease in 2014. That's positive news for retailers, who have maintained their loss prevention spend, during a difficult financial period, to keep losses under control. "That said, the problem is that inventory loss not only represents an erosion of the bottom line, it means someone else can't buy a product. Solutions that help keep merchandise available are invaluable and are proven to improve sales. Ultimately, with the rise of omni-channel retailing placing the high street under strain, protecting profits is the only way to ensure long term success. "What's vital is that stores use the wealth of data available to identify where their losses are coming from."